The thing I love most about sewing is that it is a never ending, learning process. There are always new skills to learn and you can always get better. The way I have learnt to sew is to continue to make garments or try techniques that I haven’t before. With this in mind, I’ve made another coat. Not feeling so adventurous, I chose Simplicity 1067 which is a pretty simple pattern with only one closure. I’ve taken to researching patterns on instagram before I make them and many people who tried this pattern in fleece seemed to report that it felt very dressinggown-esque! So I went with a red tweed that I got from Ebay. I was really pleased with this as I wasn’t sure whether it would feel a little too upholstery but it’s quite light. Anyway, I went with View A, and opted for pockets but not a hood. The optional pockets and the front pieces come together first and then the back. The large collar is made using a big piece of facing, which I hand sewed in to place. In order to make the insides neat, I used Hong Kong seams on all the visible seams, using a black, floral bias binding to cover the edges of the fabric. I was worried that would make it feel a bit stiff but because the fabric has a little natural stiffness, it has worked out quite well. I used the bias on the edge of the facing and that nicely covered the insides of the collar. It needed quite a bit of pressing but I was really pleased with the how it neatly came together. I inset the sleeves (still my least favourite job) but these worked out quite well, I think this was because there is a bit of natural give in the fabric. I then used bias binding on this seam as well. I topstitched the seam to the sleeve opening, which is not in the pattern but I think it looks quite nice. The hem is created by sewing the facings to the front and then continuing the line which is created all the way round. It suggests hand sewing this and the sleeve hems but by this time I had spent a lot of time on this coat and ready to move on to new projects, I hemmed it with my machine. I sewed the little clasp in place and voila! She is complete. I absolutely love the style of this coat, it is roomy but stylishly so, the collar is such a statement which is so me and I’m so pleased with the colour. I can completely see how this would eaily feel like a dressing down so for anyone who feels they might try it, definitely stick to more structured fabrics. I have literally not stopped wearing this since I made it, I absolutely love it, it’s so practical and so me. I love it when sewing plans come together to be exactly what was planned! I have seen soooo many Keilo dresses in my research before making this dress, but I’m so pleased with my recent make, that I had to show it off. 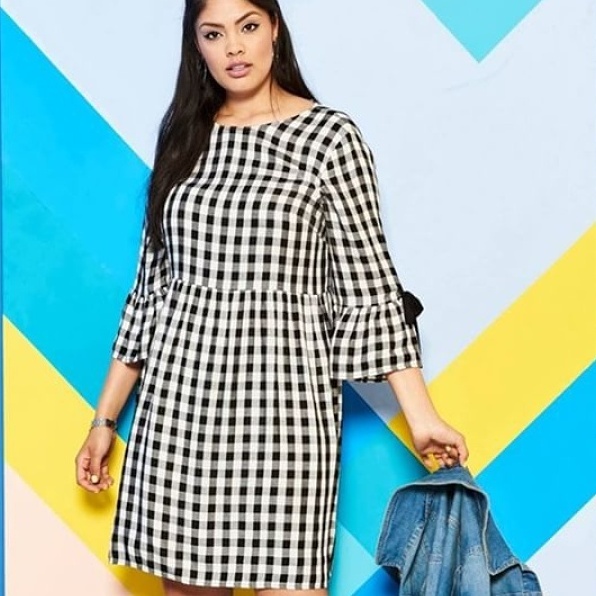 The kielo wrap dress looks like it would be unshapely and has a really odd shape, however, due to the amazing long ties, which are cleverly concealed within the seams of the dress, it wraps exactly at the waist, taking the fabric around you and creating a lovely, flattering, silhouette. The Kielo is made to be a maxi dress, however, I know for past experience, that I rarely end up wearing a full-length dress so I shortened it significantly to a knee-length dress. I found that due to the shape, it requires quite a lot of fabric but I did expect this. I bought some lovely, crackle look black jersey from Sewlicious and went ahead. There are surprisingly few pieces to cut, just the front and back and the ties, though I cut the back in two pieces due to fabric restraints. I also included sleeves as I don’t like to not have sleeves. Named Clothing have released sleeves to go with this and I couldn’t be bothered printing them out but I used my familiar Moneta dress sleeves and it worked perfectly. The dress calls for darts at the bust and the back. I have rarely sewed darts in jersey and found it a bit challenging to be honest but it was completed and I continued. I inserted the sleeves and everything else on the flat, which is my favourite way to sew and then you essentially sew up the sides. Easy. The neckline is simply folded and sewn as a hem. When I make this again (there will be an again) I will lower the bust darts slightly and I would also lower and round-off the neckline but I love it. I cannot believe I left it this long to make it! This was a good choice of fabric by the way, it feels really glamourous whilst still being a jersey and I love it! Today’s dress is another Cotton and Chalk Rosie Dress. This will be the third time I have made this dress and I don’t want to bore anyone but I also want to show off the sunshiny loveliness of this dress. It’s a super flattering pattern as it has a V-neck and a middle panel, which adds shape. This and the last one I made are a far cry from my first one and I feel it really showcases how far I have come in terms of the fit of my garments. My first did not fit at all, it was badly made and I didn’t know how to change it. Fast forward 18 months and I’m able to change the fit of my garments so much more to fit me. 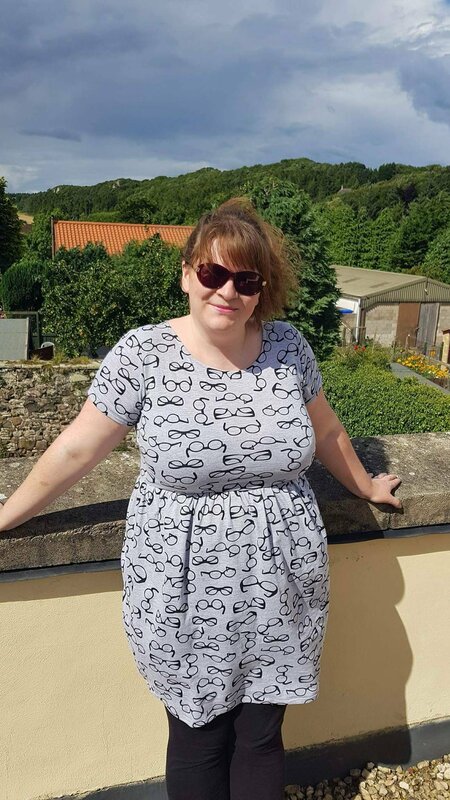 I decided to leave this one sleeveless, both due to fabric restrictions and the fact that I have to accept that I needed some sleeveless dresses in the warm weather for my holidays! I used this lovely yellow block print cotton from Sew Me Sunshine and because of the wide skirt, two metres was just enough to make it. I did not make my own binding because I did not have enough fabric so I used some plain yellow in my stash. I love binding my necklines so I love a pattern which actually plans for it even more! I also used it to finish the arm holes. 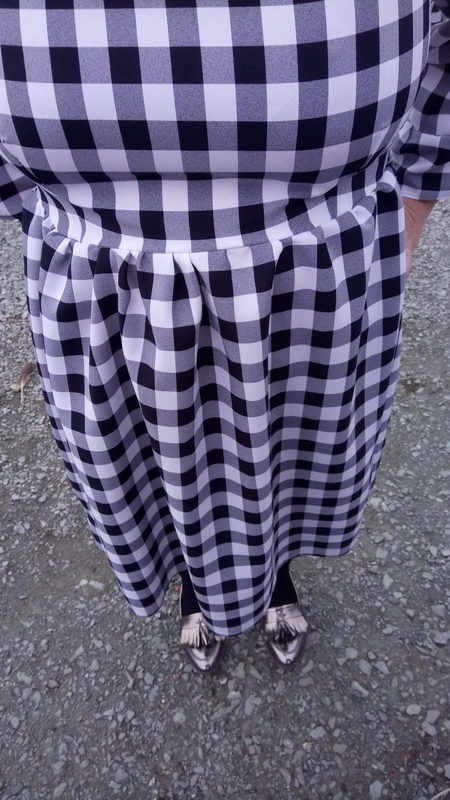 I used clear elastic to gather the skirt, which is my favourite way to get lovely, even gathers, I have written a tutorial for this over on Sew Me Sunshine and I use bias binding to finish the hem to give neat finish. By the way, my amazing necklace in a Jazzy Lapin design for Sewalicious. It’s amazing! I’m hear to share one of my favourite makes in a long time! 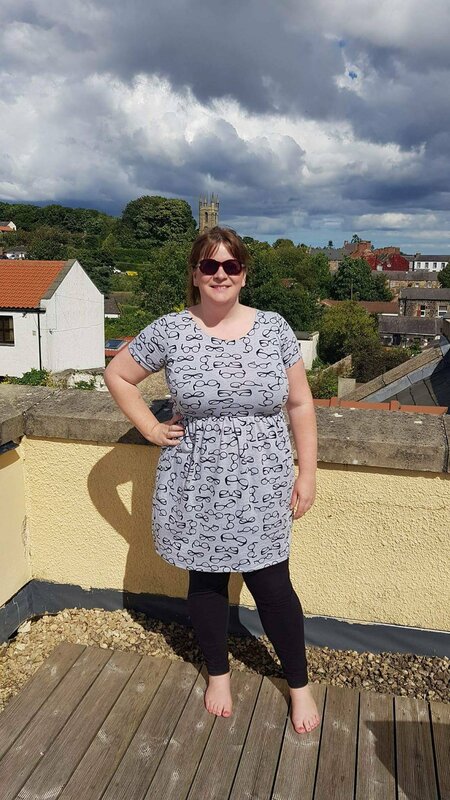 I did a real and quite proper hack using the Datura top pattern from Deer and Doe and the Lily Dress from Simple Sew. First the fabrics; I used a yellow linen from my stash, which I got quite cheaply from Ebay and this beautiful viscose linen which I got as a remnant from Sew Me Sunshine. I used the yellow linen for the neckline only, to make it pop and also to make my remnant stretch further (not that we admit to things like this!) I also used it to make plenty of bias binding for the neckline and sleeves. Anyway, I did the hack by cutting just the top section of the Datura top which comes to just above the darts in yellow. I should point out that I have done several toiles of the Datura already as the pattern doesn’t actually go up to my size (here is not the time or place for a rant about that!) Anyway, I then folded the dress piece for the Lilly Dress so that it lined up with the top piece. I made sure that all the darts remained and that the arm holes would be big enough. I then proceeded to cut the rest of the dress as usual in the lovely viscose linen. I completed the facings for the neckline and then attached it to the bottom half of the bodice. 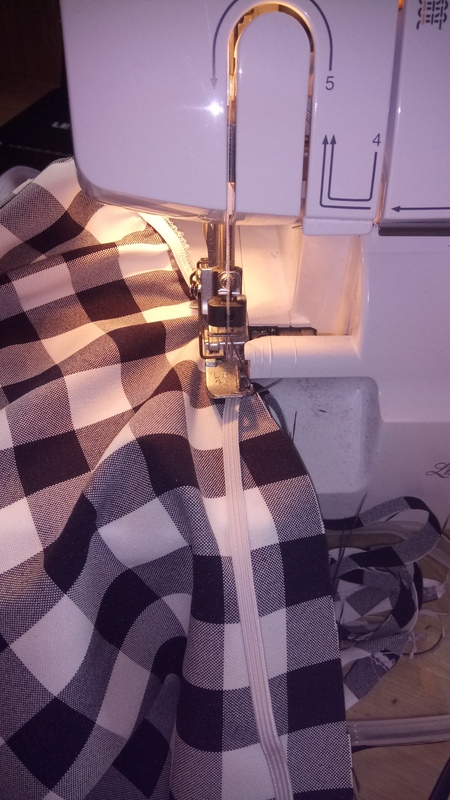 I made bias binding, which is not something I relish but a necessity for this garment. A few people have commented that the neckline looks difficult, which was my first instinct but it’s well instructed and surprisingly easy and very very satisfying!! It just needs a lot of pins! Once the top half was done, I decided to change up the bottom too! I drafted a quick contrast pocket in the yellow first. The Lily Dress has a gathered skirt but I decided to do pleats in line with the darts on the bodice. I’m actually amazing that I managed to pull this off because I was winging it but I just pinned everywhere and then hand tacked the darts where they should be! I think it gives shape but is a little bit more sleek. I am so happy with the finished product. It’s a great fit and so bright and cheerful. 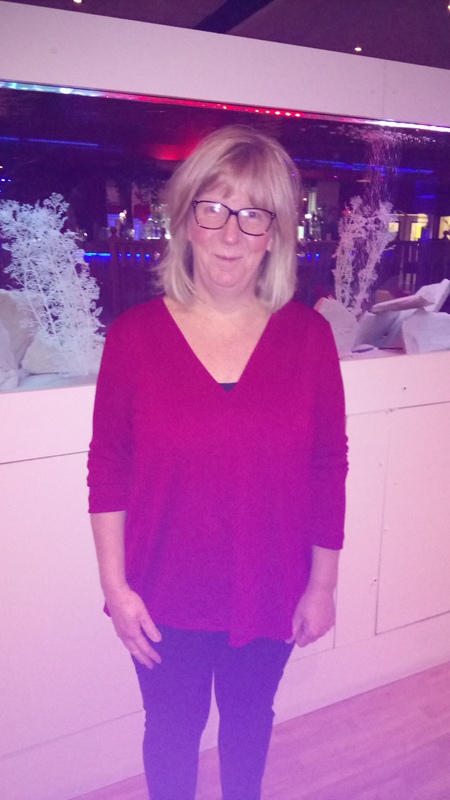 I wore it out to dinner with my lovely hubby at Vilamoura, which is a beautiful marina in Portugal. It’s been a while since I’ve had chance to do a holiday series… I’m not complaining, I’m lucky that I go on holiday quite often usually but this is our first and only this year so I’m making the most of it. We’ve come to Portugal with my lovely in-laws and of course, my me mades have come too! 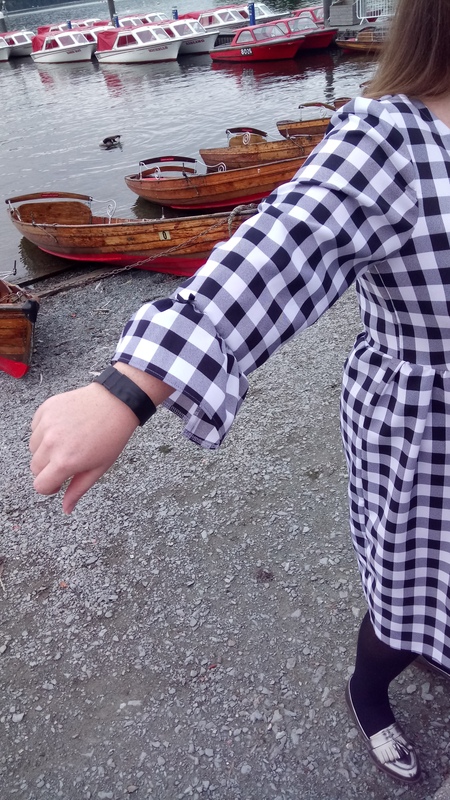 Day 1 – I never blogged this top as I was meant to be a Toile for my bee Kalle tunic but I actually wear it more than the second! It’s perfect for travelling and I would definitely make more. I wore it with RTW secret pyjama pants! Day 2- although I had cut the new costume by Cashmerette, I didn’t get chance to sew it… So they’ll be no pictures of me in my cossies (I know, what a shame!) However, I did make this tote bag which is self-drafted using this fab vintage swimmer remnant from Sew Me Sunshine. I used rectangles to construct it and tapered the corners. I included little pockets inside and a little coin pouch. Perfect for the beach! Day 3- we visited Loulé Market today so I wore my new Ultimate Trouser shorts. I made the trouser pattern a while back and was instantly hooked. It’s such an easy make and I got these out of a remnant of 70cm of this lovely stretch cotton (perfect for ultimate trousers) from Sew Me Sunshine. Quite a lot of my holiday makes are made using remnants from when I have a bit of a splurge! I wore a RTW vest, I have recently bought the ogden pattern but I’ve not had much time to master it yet! I even found a fabric shop, which made my day! Day 4- another lazy day on the beach but I did wear these awesome trousers for dinner. They are Self-drafted wrap trousers, which I saw at a craft fair some time a go. They were selling for £45 (queue brain saying ‘pfft, I could make those’) and I made these up super quick in 2 metres, for a grand total of £4! I would really recommend making some, they are super flattering. It is essentially 2 rectangles sewn together using a semi circle shape for the crotch which you then tie at the front and the back. I proudly wore them with my new Pink Coat Club Me Made necklace. Day 5- having fully intended to make a plethora of Ogden Camis for the holiday, I only actually made this one. I used this fab grey fabric with neon splodges which I stashed from a craft fair last year. Perfect teamed with white jeans. Day 6- saw the return on my Velo Cullottes,which I wear a lot. They are made in a silky soft peach skin from Sewisfaction. The pattern is perfect and a great fit. Plus, they have pockets!! Day 7- I made another Cotton and Chalk Rosie Dress, I’m afraid! I love this pattern and find it so flattering. 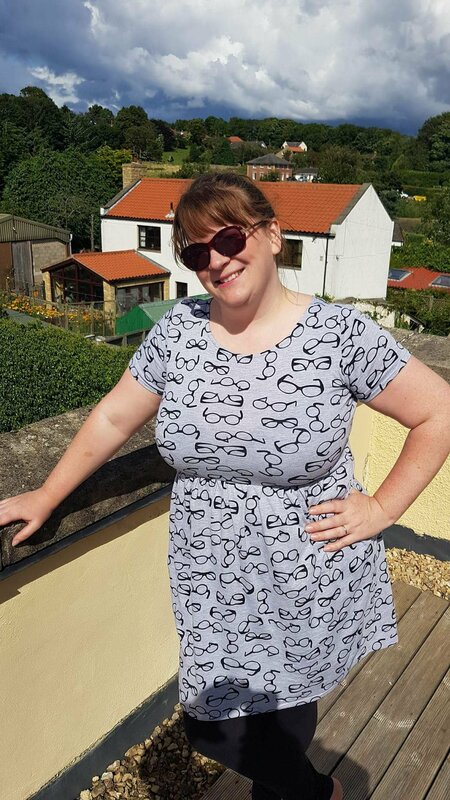 I won’t blog about it separately having already made 2 but the fabric is a block print cotton from Sew Me Sunshine and I feel I’m really perfecting the fit now. I wore it with my new Sewing Machine necklace from Sewalicious. Cool. Or. What? Day 8- I wore a Deer and Doe Datura hack to Vilamoura for a meal, which I will blog fully soon but I LOVE it! Day 9- we visited Faro, which was the best day ever!! 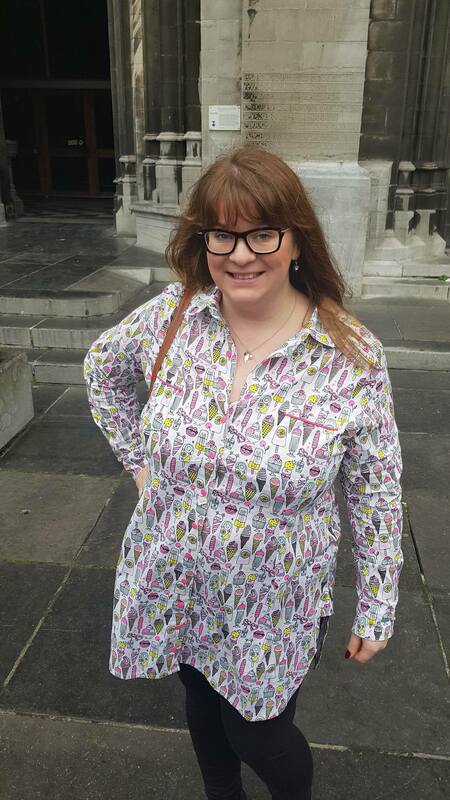 I wore a Sew Over It, shortened Florence Dress in this tropical print from what is now Pound Fabrics. It’s a super easy pattern and really cool to wear. The eagle eyed amongst you may notice that I have gotten a little rounder over the course of the holiday but the food was truly amazing. I have never been anywhere with such amazing food. I realise that mine is a sewing blog but I just wanted to quickly share some of the amazingness. Really yummy! 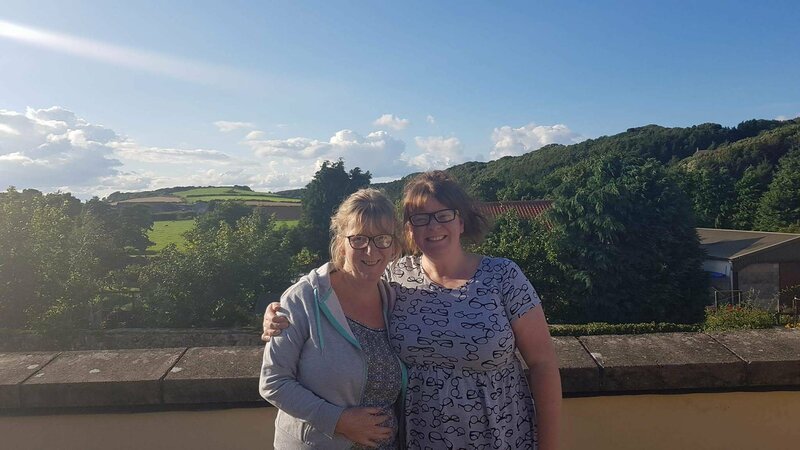 And whilst I fully promote curvy sewing, I have left Portugal feeling a little bit too curvy for me so thank god there’s no Portuguese steak around!! See you soon for some individual makes! Don’t forget to check my. Instagram where I update my currently wearing quite often! Just a quick update… We’re finally in the new house but the sheer amount of work needed on it means my machine is still in a box. Fear not… I did get quite a bit of sewing done before my machine was packed up. However, being organised as I am, most of this was for my holiday. Guess what! It’s holiday time! This means I finally get to share my lovely makes with you. I will do a holiday series, especially for Portugal, like I have done before here and here and here and I’ll also blog the individual items because they are so worth it! I’ve been making attempts to get through my to-do box before getting distracted by some of the lovely fabrics you may have seen in my last post. 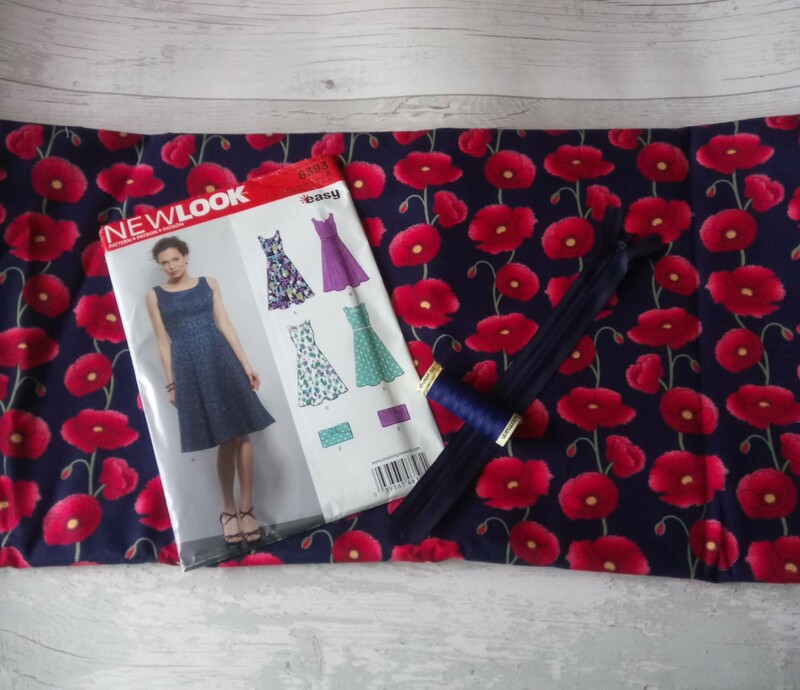 The Mia set which came with Simply Sewing Magazine last July, tempted me straight away and I used this unusual fabric I got for a bargain on eBay. I thought it would look really cool as it’s quite a wacky fabric but the pattern is quite simple apart from the sleeves. I have shown this over on Youtube already but I wanted to give a few more details. I cut it out straight away. Due to fabric restrictions, I only cut one of the two optional sleeve pieces which make the fluted look at the ends. Then… I got distracted and it sat in my to do box until I have been off over Christmas! I felt it was about time I showed it some love! So, out it came! It’s a really quick sew so it was a travesty that it remained untouched for so long but at least it meant that I could use my overlocker so the whole thing looks so much more professional. I was able to overlock the curved edge of the sleeve and fold it over to hem it, it’s such an easy way to hem curves. It has a simple shape like a shift dress, with darts from the arm hole to the bust and that’s it. I would definitely give the dress version a go at some point. The sleeve options are either, one big circular sleeve or two flutes which are smaller. I only used one of the smaller pieces as I thought two might be a little much in this fabric. The set comes with no fastenings but with the option for a small opening the back, I chose to ignore this and cut the back piece on the fold. Similarly, I ignored the facings (as I usually do) and used bias binding. I cut the fabric to use the border along the bottom so all that was left was to use the lines in the border print to do a quick hem and I’ve got a simple top with fluted sleeves, which I love! Other than the border print, I have kept the pattern placement random as I think with a fabric like this you just need to just go with the flow. I wore this over Christmas and on a day out to Carlisle with my husband. He, as always, completed his marital duties on being my photographer in chief. I am a little travel creased though, I’m afraid! I am so excited about my first blog post for the Sunshine Bloggers Team! When I was asked to be part of it, other than being RIDICULOUSLY excited, I was all ice creams in my head because I knew I HAD to use the amazing Rico ice cream fabric for my make. It’s fantastic, I love the print and the fabric was an absolute dream to work with. My absolute dream outfit!! Go and check it out over on Sew Me Sunshine’s Website where there is also 15% off novelty fabrics, including the ice-cream this weekend!! 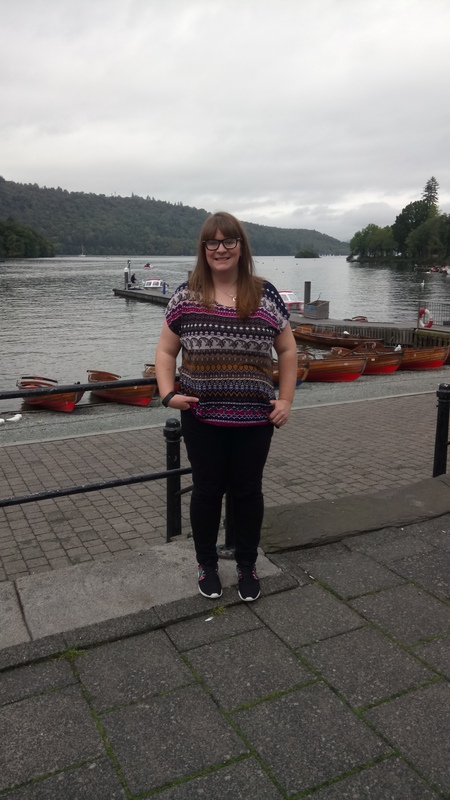 In the latest in my series of me made holidays I have recently been to Lake Windermere for the weekend with my Mum and my Sister. As many of you will know, I always try to make something nice ready for my holidays, but I try to stick to practicality too. With this in mind and thinking about the fact that it ALWAYS rains on our trips anywhere I bought this amazing umbrella Fabric. It’s a great shape on her and it was so easy to whip up. I will definitely be making one for myself soon ! 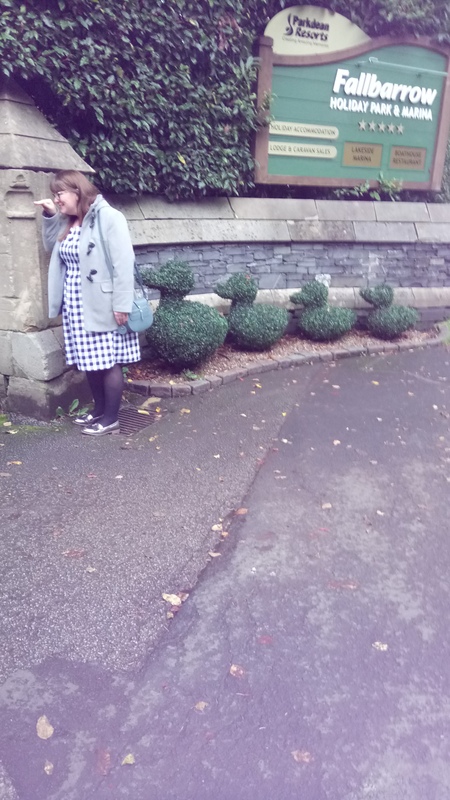 On the Saturday I wore my BlancTee by Blank Slate Patterns in this jersey from sew sew sew. It was such an easy make (literally two pieces and a neckband) that I didn’t bother blogging it. It’s a great staple piece though and something I’ll definitely repeat as it’s easy and has a relaxed shape. I’d definitely recommend it, especially if you’re a curvier lady who likes a looser fitting Tee. Plus, it’s free if you sign up to Blank Slate Patterns Facebook page. That evening I wore my French Navy Orla Dress which I have talked about in my vlog and blogged here. I really enjoyed wearing it. I think the gathers at the waist make for a really flattering fit and it’s great for full busted ladies. I would pinch an inch out of the neckline though as it’s a bit roomy. Anyway, I wore it with my new shiny silver brogues out for tea. 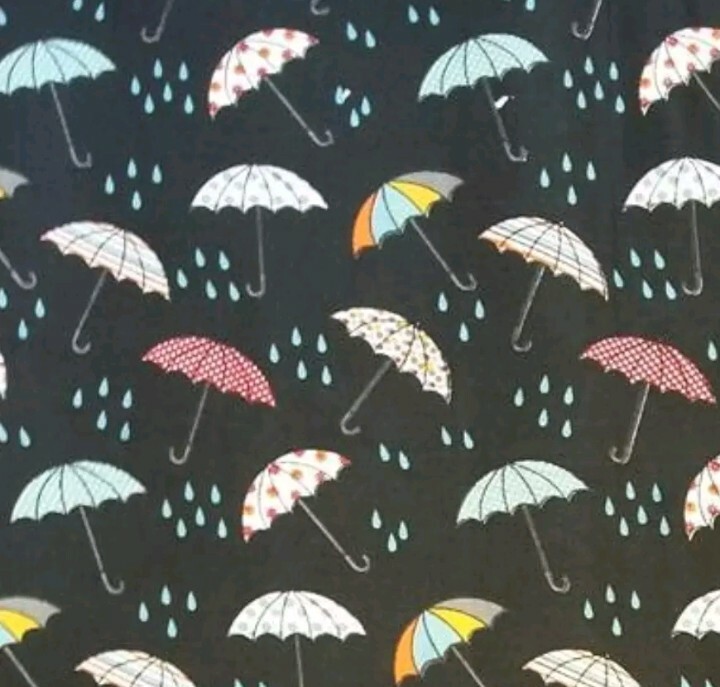 On the Sunday I wore my SewGirl Tunic Top which I made using this amazing umbrella fabric as it always rains when we go away (I thought I was being funny!) and… it didn’t rain. I wore it anyway with black leggings (these are RTW so pattern recommendations would be appreciated). This tunic is just what I needed for this highly patterned fabric. I had made it before so I knew I liked the shape. I made this one longer and added a pocket but I made no other changes. I didn’t take any pictures so see the vlog for a closer look! I’ve since been to Ostend so look out for another post soon! This is my most favourite dress is a long time. The kind of make when you take it from your machine after the hem and think Awwww Yeah, this is a good one! I got this fabric especially to try and replicate this dress I saw on Simply Be as I glamourously mentioned in my vlog. It caught my eye and I really liked the relax style of it. I thought a slight hack of the French Navy Orla Dress which I have made a couple of times now, once as the dress and once as a top hack. 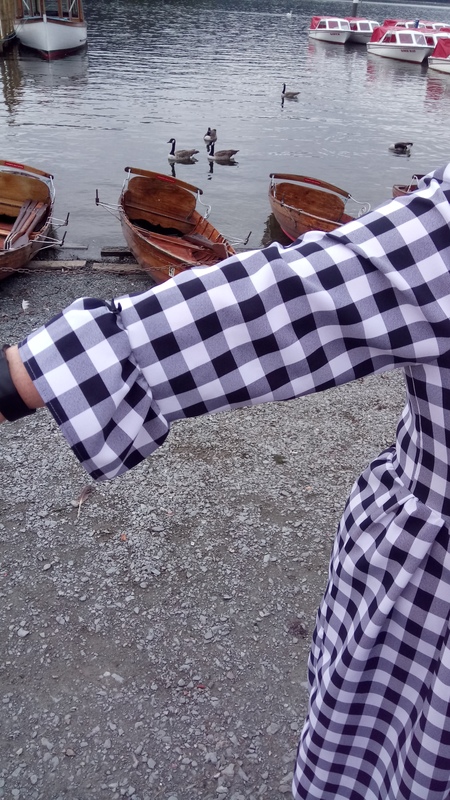 Anyway, I know it’s a great dress to hack but I only really needed to add frills to the sleeves, the rest is very similar to the Orla. 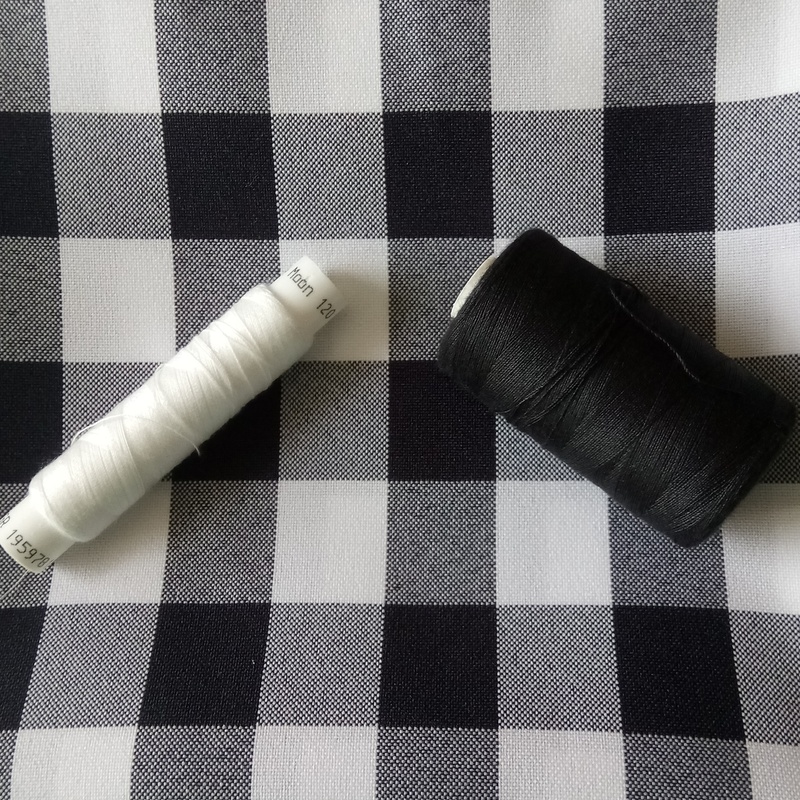 It’s difficult to chose a thread for a fabric like this; the instagram world voted white as a majority so I went with white and used white in my overlocker. I only changed this to do the black bias on the neckline. I cut the fabric, using the squares to line up as much as I could. I lengthened the sleeve pieces and added some fabric to the width of the skirt so that it would be fuller. I also cut two extra pieces for the ruffles on the sleeves. I used the remaining fabric to create the ruffle for make recent skirt make (maybe link) and I knew that as I tried to gather it, it frayed ridiculously. To try and avoid this I used elastic to gather, similarly to what you do for the Moneta by measuring the length of the bodice and cutting a piece of elastic to that length. I then overlocked the elastic on place. I did the sleeve ruffles in the same way. It created really neat and even gathers and I would definitely do it like this again. I the attached the skirt and the bodice and overlocked them as normal. The sleeves with set in and this wasn’t any different as the ruffle was already attached. I finished it with a 18inch black zip and black bias binding. I attached some little bows at the sleeves. I think the bows of the dress are a bit bigger but I’m not much of a bow girl so I used smaller ones. 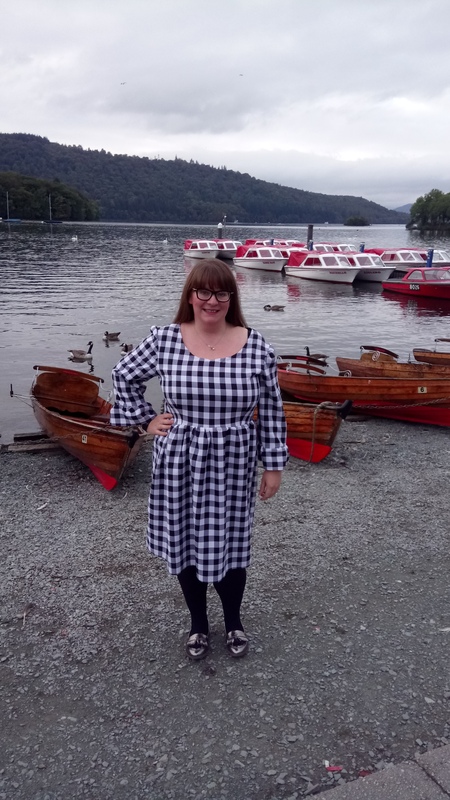 I think the dress is a great shape, it is lose without being unflattering and I’m so pleased with it as a replication of the dress. So I saved £23.40 and I probably have a better fit. Bonus!! It’s definitely worth using the high street as inspiration- what do you think? 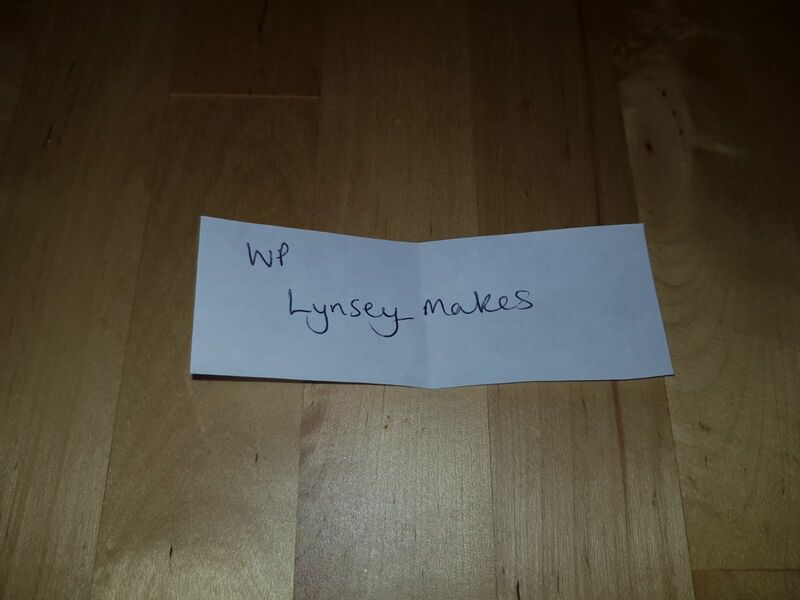 As many of you will already know the winner of the Bloggiversary Giveaway was: Lynsey of Lynsey Makes. Congratulations to you Lynsey and I’ll be in contact soon. She wins this lovely bundle: thank you again to Sheona at Sewisfaction for donating the gorgeous fabric. Thank you so so much to everyone who supported this. I was so overwhelmed with the amount of kind and supportive comments I had. Let’s hope it can be even bigger next year! Anyway, back to what I do best… The blog. Today’s make a a very hacked version of the French Navy Orla Dress. It actually looks nothing like an Orla Dress anymore. I find the pattern a really good block to change around so I’ll talk you through what I did. I used this gorgeous Cotton Lawn that I got in a Fabric Swap at Sew Up North, I’m really pleased that I’ve hardly stashed anything I got from Sew Up North. I’ve been slowly working my way through them. I made a collage of the fabrics and I’ve been updated it with my makes on instagram so you can see the fabrics I have used! Anyway, the pattern -I extended the bodice to curve round and make a top. 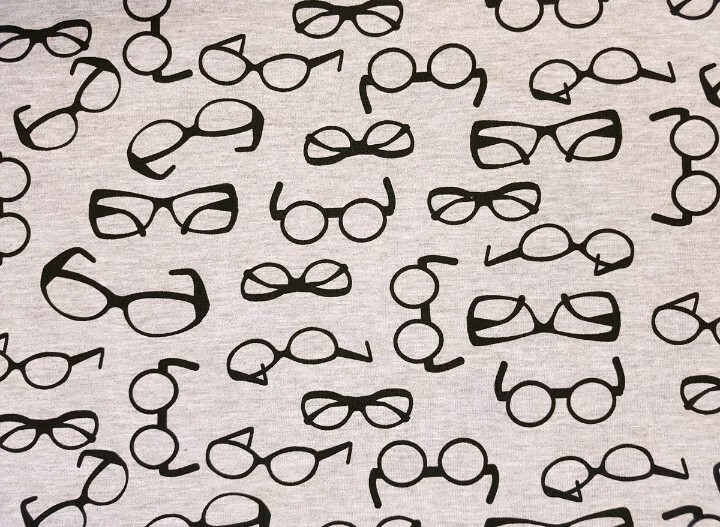 I used another pattern to make some darts and treated it as a T-shirt. I then lowered the back neckline to above my bra strap by putting a bra on my Suzie Dressmaker doll and pinning it when it wanted it to sit. I then used the fabric to make two long straps (so therapeutic!) and pinned them to either side of the back neckline before attaching the bias binding. I think it adds a really cool feature. Finally, I lengthened the sleeves to three quarter length and attached them. There isn’t a lot of gather in the sleeves of the Orla which I really like. There you have it; I have a casual, comfy top with an added detail which I love. I will definitely use the Orla to create more personal garments. These may be some of the last pictures from my holiday, which makes me sad but it’s such a beautiful place for them. At least it means not more pictures of me in shorts for you lovely people! I also wore it for my first ever vlog which has also been really well supported so thanks so much, you can find my channel here. Anyway, I knew I could only do this justice with a Moneta. It was extra wide so I only bought a metre and managed to get the whole dress out of one little metre. That’s an XL… Pretty good when the pattern calls for 2.5! Anyway I made very small changes to my usual Moneta style. I shortened the sleeves and made it a very short sleeve. I seriously considered adding a collar but I can’t bring myself to do a jersey collar. So all made as usual… Until the skirt. The pattern isn’t directional and on a whim, I went absolutely crazy (hmm) and turned the pattern pieces the other way. This meant the wider bottom was at the top. It meant much more to gather and then the skirt falls in a little more. I was thinking it would give it a more tulip shape… What do you think? I think perhaps it isn’t as flattering but I can’t not like it. It’s another secret pyjama dress too! 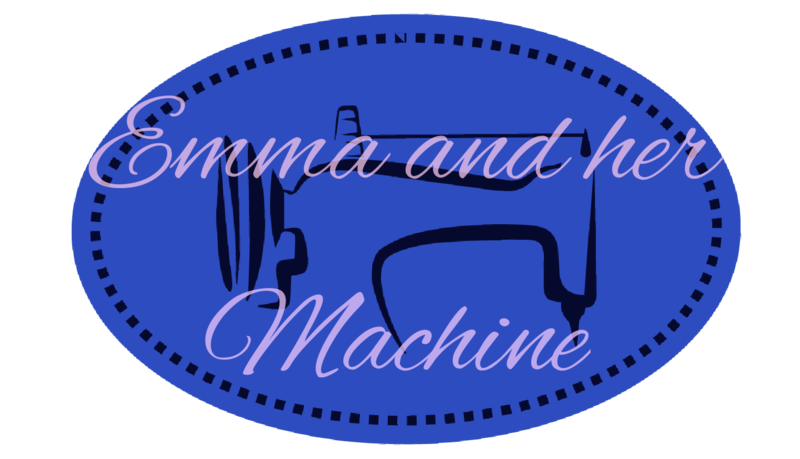 A beginners sewing journey, learning all the time along the way. Hoping to process into more complex patterns as time goes on. When life gives you melons do an FBA. 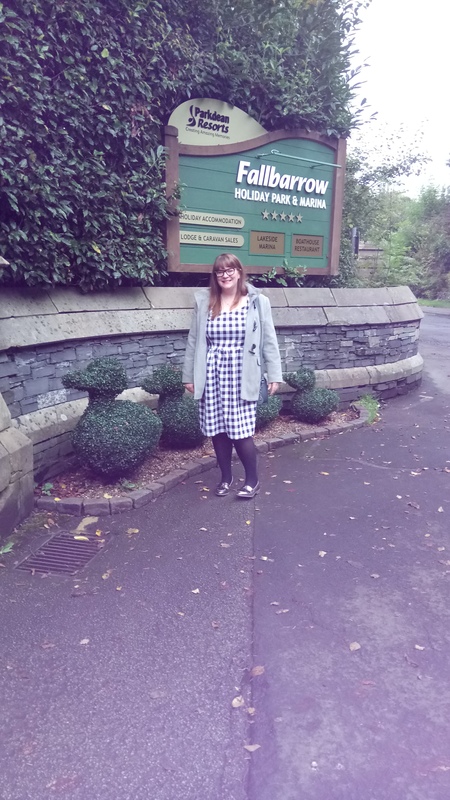 My adventures in sewing a handmade wardrobe.